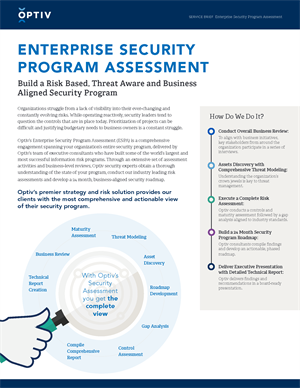 The Optiv Executive Security Awareness Program provides highly-tailored, concierge-style cyber security services to c-level executives and board members. The flagship offering is the Executive Vulnerability Assessment Service. Optiv’s highly seasoned and experienced chief information security officers and former executives from federal law enforcement agencies such as the FBI deliver this service.